Reference number for this case: 30-Aug-54-Angers. Thank you for including this reference number in any correspondence with me regarding this case. Angers. -- A resident of Angers, Miss Claire Cordier, living in Bresigny street, in Angers, has stated that at 08:20 p.m. she saw from her window a brown disc with a halo of green lights, flying at a fast pace toward the north. As it passed she heard a slight humming sound. A roofer living in the same street, Mr. André Greffier, was also a witness of the occurrence which he saw from his garden, where he had gone on noticing the green lights crossing his kitchen window. The Lionese have their flying saucer too! As we reported yesterday, the residents of Angers finally had their flying saucer. But the Lionese have had theirs, too, undoubdedly the same one. On Monday, at about 08:20 p.m., Mrs Poirier, who lives near the church, was in her courtyard with a neighbour, Mr. Sanson, when they saw in the sky a brilliant light in the shape of a disc followed by a rather short tail. This light seemed to come from a great height and to be approaching the earth rapidly. Suddenly the tail disappeared, the brightness changed, and the disc dropped vertically and disappeared. The speed seemed to the witnesses to be much greater than that of a jet airplane, but slower than a shooting star. No sound was heard. The phenomenon (or craft) was travelling from south to north. A disk-shaped object was (no date given) observed by various persons simultaneously at about 2020 hours, flying over Angers and Lion-d'Angers, both in La Maine-et-Loire Department, and over chateau-Gontiers, Mayenne Department. The object was generally described as being brown and emitting a short trail of and odd hue of green. According to Claire Cordier, a nurse in Angers, the object gave off a soft drone, and its glow was reminiscent of the light in neon tubes. The phenomenon was visible for several minutes. Aimé Michel indicates that on september 1st, 1954 at 08:20, Miss Claire Cordier, nurse, was at her home in Bressigny street in Angers in Anjou, when a strange light made her come to her window. She looked towards the sky and saw a brown red luminous disc haloed by light green reflections which moved at a speed much higher than that of a plane, but not as quickly as a shooting star, to the direction of North. The city making only low noise, Miss Cordier used her ears and perceived a light humming, but she did not allot it with certainty to the object. After a little more than one minute, the object disappeared on the northern horizon. At the same time when Claire Cordier moved towards her window, André Greffier, also residing in Bressigny street in Angers, was in his kitchen. He was also intrigued by odd reflections seen in the glassy canopy of the room. He went out in the garden and also saw the object, of which he gave a description identical to that by Claire Cordier, that is to say a circular shape, a red brown luminosity with green reflections, fast move towards the north. André Greffier did not report any noise. Aimé Michel indicates that among the simultaneous observations in the Anjou on September 1, 1954, there was that of two witnesses in Lion-d'Angers, 22 km to the North of Angers on the road RN 122, which saw the same object as that seen in Angers at the same time at 08:30 p.m., arriving from the south. The object quickly crossed the sky in direction of North, having been in sight during approximately a minute. It is circular, red brown with green reflections and no noise is heard. The two authors indicate that in Angers on September 27, 1954 a brown disk and a and greenish hue were observed. UFO sails over the French countryside. Earlier in the evening at 8:20 p.m. a bright light lit up the house of a Mlle. Claire Cordier, a French nurse who lived on Rue Bressigny in the town of Angers. Drawn to the window by the glare, Mlle. Corddier [sic] looked at the black sky and saw, moving north, a glowing brownish-red disc that emitted a greenish aureole. Mlle. Cordier's neighbor, M. Andre Greffier, was also attracted to the luminous phenomenon and he went out into his garden to watch the UFO as it flew swiftly north, disappearing quickly over the northern horizon. About a dozen miles north of Angers, citizens of Lion-d'Angers observed the same object pass over, taking about a minute to cross the heavens. Some 14 miles beyond Lion-d' Angers, the circular red-brown thing flashing green light was last seen still flying to the north. 9. 8. Michel, Aime. Flying Saucers and the Straight-Line Mystery, New York, N.Y. Criterion books, 1958. p.33. The Belgian ufologist indicates that in 1954, on September 27, in France, in Angers, "At 20:20: observation of a brown disc and greenish gleam." The source is noted "M. FIGUET/J.L. RUCHON: 'Ovni, le premier dossier complet..' - Alain Lefeuvre pub. 1979, p. 92". "August 30: [...] but according to Claire Cordier and André Gréfier, 2 natives of Angers, the object disappeared towards the North. Claire Cordier announced a "disc" flying above her city also [see September 4] "
"September 1 [... 20. 20: An object in the shape of disc is observed simultaneously by various people, flying above Angers [...] The object is generally described as dark or emitting a trail of smoke of a strange blue or green. According to Claire Cordier, a nurse of Angers, the object emitted a light buzz, and its gleam reminded of that of neon tubes. The phenomenon remained visible during several minutes." Luc Chastan indicates in his database that in the Maine and the Loire (49) in Angers on September 27, 1954 at 20:20 hours there was an "Observation of a brown disc and a greenish gleam." The website indicates that on 27 September 1954 at 20:20 in Angers, France, "Neon-lit disc flies east to west, stops for 6 seconds, shoots rapidly to the north." And: "A flying disc was observed. One disc was observed by three witnesses in a city for several minutes." *Sep. 1, 1954 - At 8:20 p.m. a brownish-red colored disc, encircled by green flashes and making a purring sound, was seen between Angers and Anjou, Maine-et-Loire department, France. It flew on a rapid course toward the north. (Source: Aime Michel, Flying Saucers and the Straight Line Mystery, p. 32-33). Figuet and Ruchon [fr1] have the date wrong, and the error is reproduced by [go1], [lc1], [ud1]. [lr1] Article in the regional newspaper La République, Pau, France, September 2, 1954. [co1] Article in the regional newspaper Le Courrier de l'Ouest, Angers, France, September 2, 1954. [---] Article in the newspaper "Alger Républicain", Algiers, Algeria, September 4, 1954. 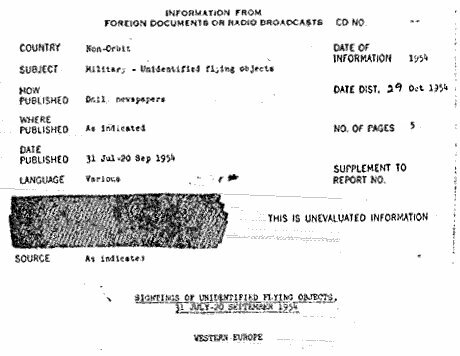 [ci1] "Information from Foreign Documents or Radio Broadcast - Sightings of Unidentified Flying Objects, 31 July - 20 September 1954", report by the CIA (Central Intelligence Agency, USA), pp 1-2, October 29, 1954. [am1] "Mystérieux Objets Célestes", book by Aimé Michel, Seghers publisher, France, page 46, 1958. [am1] "Mystérieux Objets Célestes", book by Aimé Michel, Seghers publisher, France, page 47, 1958. [lg1] "UFOs: A History - 1954 - September", monography by Loren E. Gross, USA, page 2, 1991. 0.1 Patrick Gross June 19, 2005 First published, [lr1], [co1], [ci1], [am1], [am2], [jb1]. 1.0 Patrick Gross February 8, 2010 Conversion from HTML to XHTML Strict. First formal version. Additions [fr1], [go1], [lc1], [ud1]. 1.1 Patrick Gross October 30, 2011 A search on the web and in my documentation did not reveal other sourcesExplanation changed from "The meteor of that day" to "The 30 August 08:20 p.m. meteor". Addition of the "Note on the meteor for that day". 1.3 Patrick Gross November 20, 2016 Addition [ub1]. 1.4 Patrick Gross November 29, 2016 Addition [lg1].